Keep food cool and fresh with this 15.0 cu. ft. Haier refrigerator. The top section provides ample storage space with its three adjustable shelves and a crisper bin, and it's simple to operate with its electronic touch controls. This 28-inch French-door Haier refrigerator has two bottom-mount freezer drawers for optimal segregation and preservation of frozen foods. You don't have to give up space for efficiency. This Amana 18.5 cu. ft. bottom-freezer refrigerator cools your food more efficiently so you save money. From gallon door bins to full-width crisper drawers, its versatile storage options fit milk, greens and everything in between. Four half-width Spillsaver glass shelves contain spills and can be adjusted when needed for flexible storage. Plus, Temp Assure freshness controls put consistent temperatures right at your fingertips, while essential design means that the fresh food you use most is right at eye level for easy access. This 29-inch Wide Amana. Bottom-Freezer Refrigerator features an EasyFreezer Pull-Out Drawer that opens and closes smoothly, even when fully loaded. Store meats and cheeses in the Deli Drawer to make your favorite go-to sandwich. And you'll know where all your frozen treats are at a glance with our Glide-Out Lower Freezer Basket and Quick Split Organizer. This 33-inch Wide Amana. Bottom-Freezer Refrigerator comes with versatile storage options like Adjustable Door Bins to help favorites stay right within reach. The EasyFreezer Pull-Out Drawer opens and closes with ease, so you can feel free to stock up after your last spree. And, like your very own salad bar, this model features Humidity-Controlled Garden Fresh Crisper Bins to help make sure you get first dibs on fruits and veggies. Underneath this timeless shape there is an inspiringly practical cooling appliance. A combination of vintage design and a choice of passionate colours make this refrigerator a welcome emphasis in your kitchen interior. As a design item it can also be easily placed in the living room, which comes in especially handy in smaller urban nests, but also in modern open-space living environments. Each retro refrigerator boasts optimal space usage, an elegant character and all the helpful features one would expect from a true charmer. Whether it is nostalgic Champagne, seductive Red, sleek Silver or midnight Black, these modern icons are an instant hit wherever they pop up. 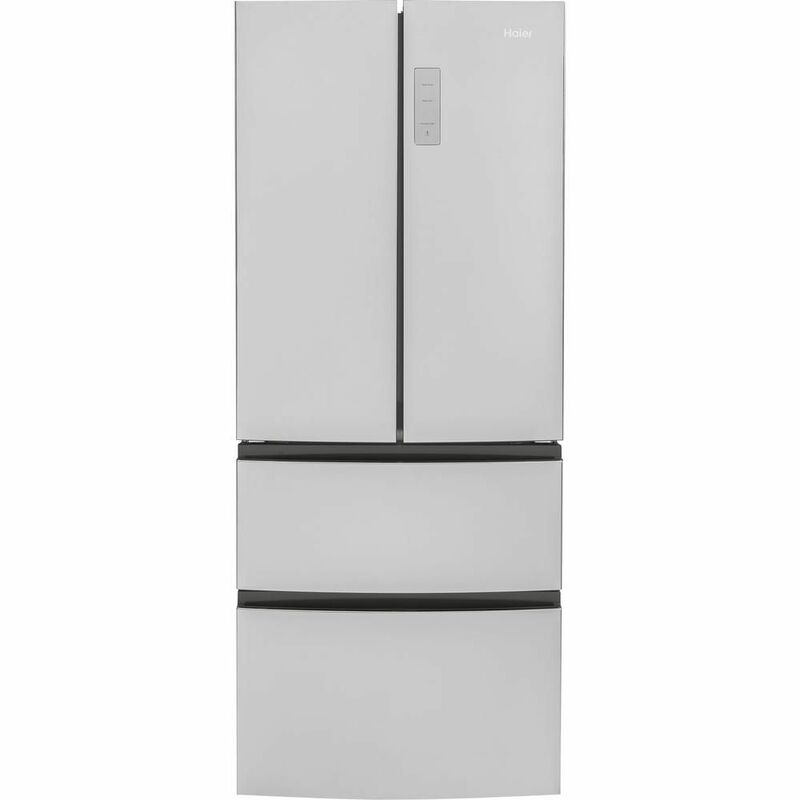 Haier 15 cu.ft Counter Depth French Door Refrigerator Keep food cool and fresh with this 15.0 cu. ft. Haier refrigerator. The top section provides ample storage space with its three adjustable shelves and a crisper bin, and it's simple to operate with its electronic touch controls. This 28-inch French-door Haier refrigerator has two bottom-mount freezer drawers for optimal segregation and preservation of frozen foods. Haier 15 cu.ft Counter Depth French Door Refrigerator is rated 4.5 out of 5 by 228. Rated 5 out of 5 by DADadNYC from Ithasbeen a month now since we installed it. Quiet,... Ithasbeen a month now since we installed it. Quiet, just right temperature for most part except the vegetables toward the back of the drawer got frozen a bit sometimes. Freezer is just right for the ice cream and no complaint for a compact French door in a NYC apartment. Recommend. Rated 4 out of 5 by Shane from Fits perfectly in the small cutout the house has. Biggest... Fits perfectly in the small cutout the house has. Biggest complaint is that a gallon of milk won’t fit with all the shelves in there. We had to remove a shelf for milk, tea pitcher, and a 2 liter would fit. Rated 5 out of 5 by Lawanda from It fit perfectly and looks wonderful inside and out. Also... It fit perfectly and looks wonderful inside and out. Also very easy to keep clean. What is the clearance between the floor and the lower edge of the bottom drawer?